The “Scrub Slack” pant infuses a classic aesthetic with an athleisure mindset. 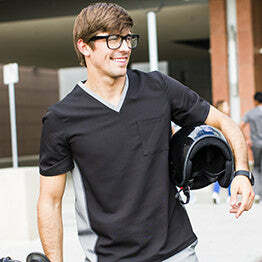 Crafted from our flexible polyester/spandex blend fabric, this pant delivers maximum functionality and live-in comfort. A straight fit and back welt pockets lend the tailored appeal of your favorite slacks.